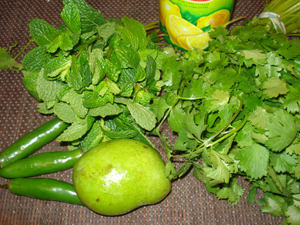 Chop the ends of the cilantro and mint bunches. Soak in cool water to remove any dirt. Pick out of the water and rinse. Peel and chop the raw mango flesh. Chop off the heads of chillies. 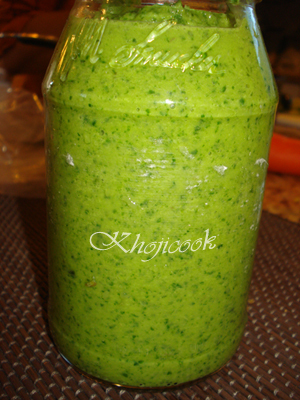 In a blender add the cilantro, mint, mango, chillies, lemon juice, salt, garlic paste, and oil. Blend the mixture to a fine paste, adding as little water as possible. Sterilize a glass jar by washing in hot water and air dry. 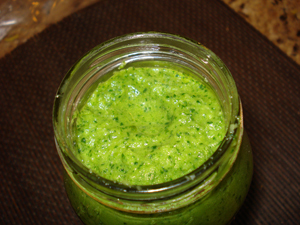 Store chutney in air-tight glass jar (empty jam jars work well). Store in fridge, use within a week. Also freezes well. Freeze in ice-cube trays or empty plastic egg cartons for a handy cube of flavor for curries.